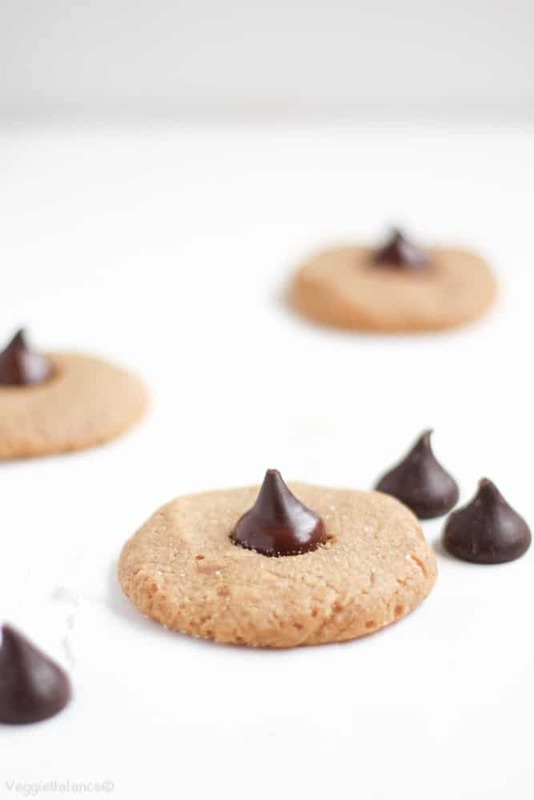 Peanut Butter Blossoms Cookie recipe made healthy, skinnier, and with no butter, oil, or flour. These cookies are gluten-free yet still delicious with all the flavor. Made with just 5-Ingredients. When I say how much I love cookies, I’m not kidding. 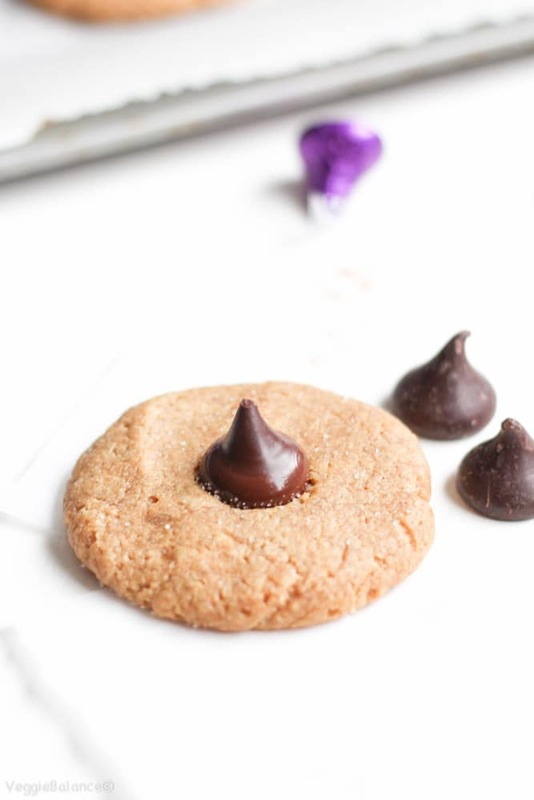 These healthy Peanut Butter Blossoms Cookies are by far my favorite type of cookie. It goes back to the peanut butter and chocolate combination. 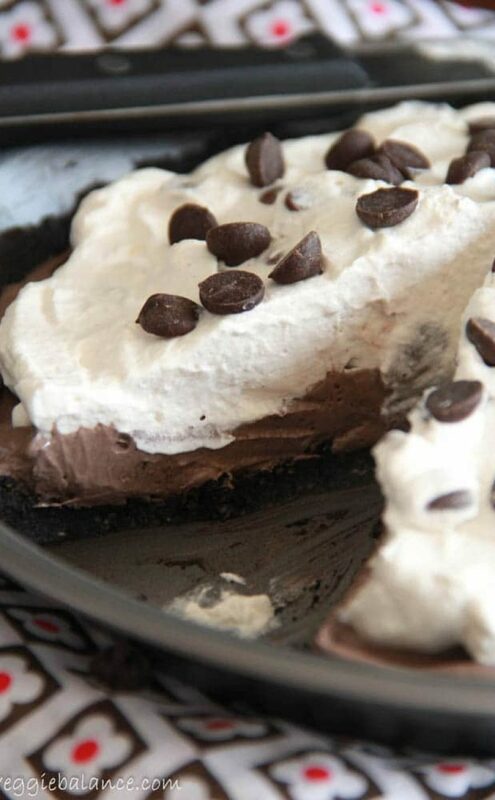 It always goes back to that peanut butter and chocolate combination; they just go together. Ever scoop out a spoonful of peanut butter from the jar, top chocolate chips onto the spoon, and expertly devour that sophisticated dessert right off the spoon? Pretty much these peanut butter blossom cookies are just that *cough* sophisticated dessert in cookie form. Do you need convincing how well peanut butter and chocolate go together? Step Two: Then, I advise you to make the cookies. Follow these steps, in order, because you must have a quick, delicious snack before making the actual dessert. Yep. More specifically though, cookies. Cookies are the epitome of happiness. I know I said last week that blueberry muffins are happiness in muffin form, but cookies are just plain, bottled up happiness. Speaking of happiness, have you seen the movie Inside Out? Well, I fortunately had the pleasure to cuddle up on the couch this weekend to watch it. 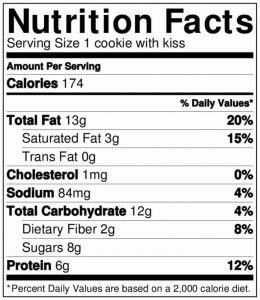 I have to say, it melted my heart, made me cry, and all around made me think about what goes through my mind when it comes to cookies. Seriously though, if you haven’t done so already, watch the movie. Of course, Pixar yet again makes an absolute knock-out movie. Also, I have an extreme weakness for talking animals and imaginary characters. So pretty much any movie they make always tugs at my heartstrings. How to Train Your Dragon. Oh my word, another heartstring trigger that caused this (at the time) 24 year old to buy the movie. (I never buy movies – like never). I’m pretty sure Inside Out s going to be on my list to purchase. My name is Lindsay, I am 26 years old, and own only children’s movies. Oh, and I have zero children of my own. That’s my life. I digress. Oh, and healthy? 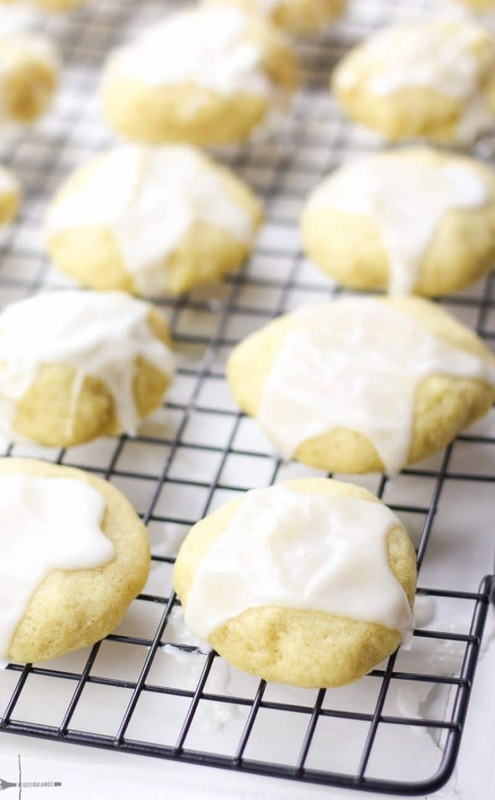 These Peanut Butter Blossom cookies are a dream come true. Pillowy peanut butter chocolate heaven. 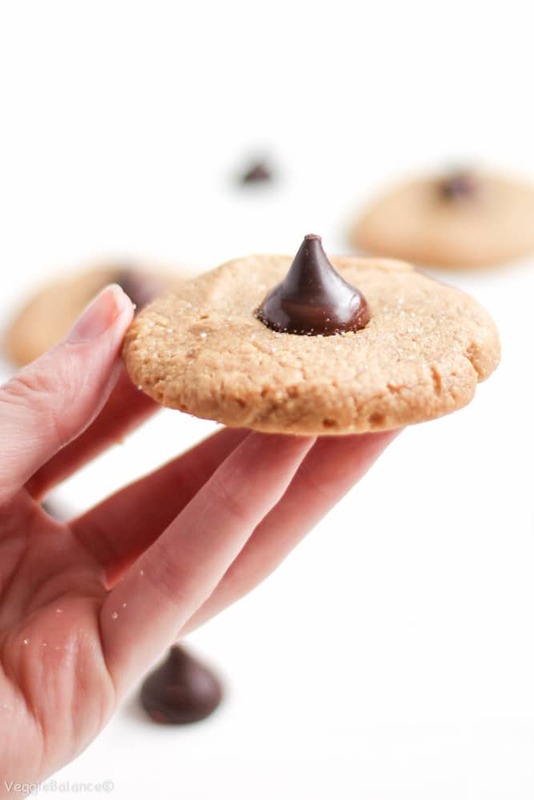 Need a little help on how to make these easy Peanut Butter Blossoms? Check out VeggieBalance YouTube channel and watch the quick video showing just how easy it really is! I’d love to see you over there. My expert foodie suggestion: Let’s make ourselves a warm cup of hot chocolate and pair it with some delicious peanut butter blossom cookies. Put on an epic children’s movie and that is what I call a perfect Friday night. Is this 26 year old starting to act old? Yep. Accepting it, with no apologies. ALSO: Don’t forget to enter for the chance to win a $700 Amazon Gift card! 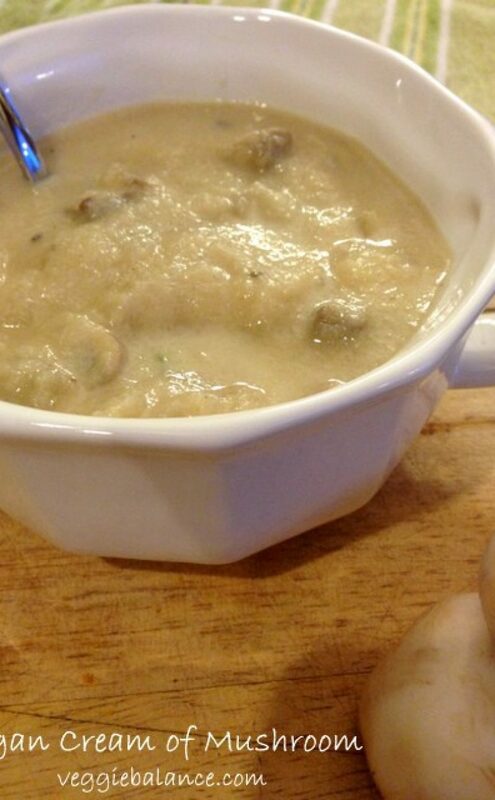 You can enter on last week’s Easy Crockpot Potato Soup post. Raffle ends January 27th! 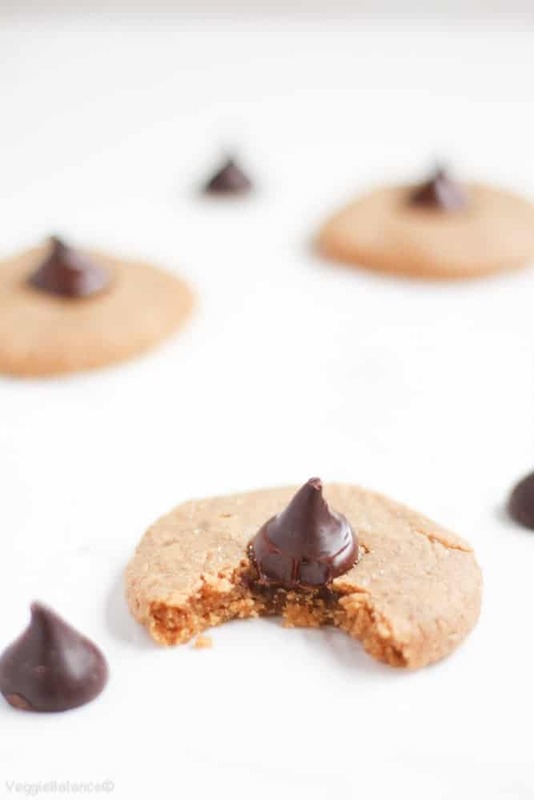 Peanut Butter Blossoms Cookie recipe made healthy, skinnier, and with no butter, oil, or flour. 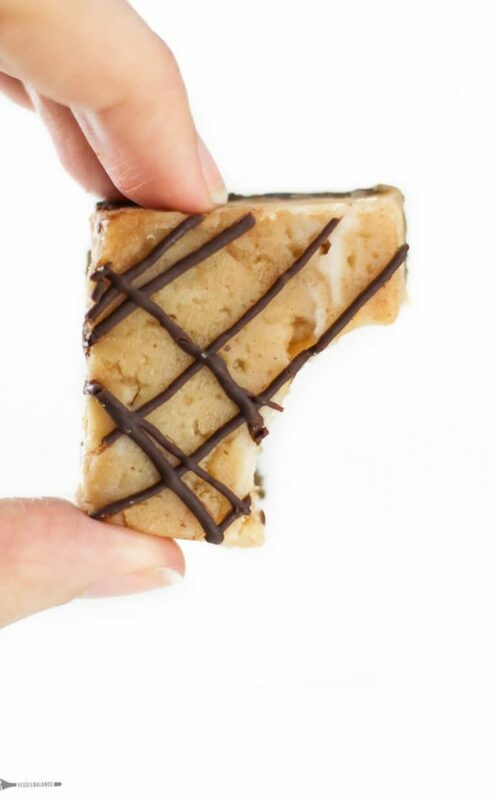 These cookies are gluten-free yet still delicious with all the flavor. Made with just 5 Ingredients. 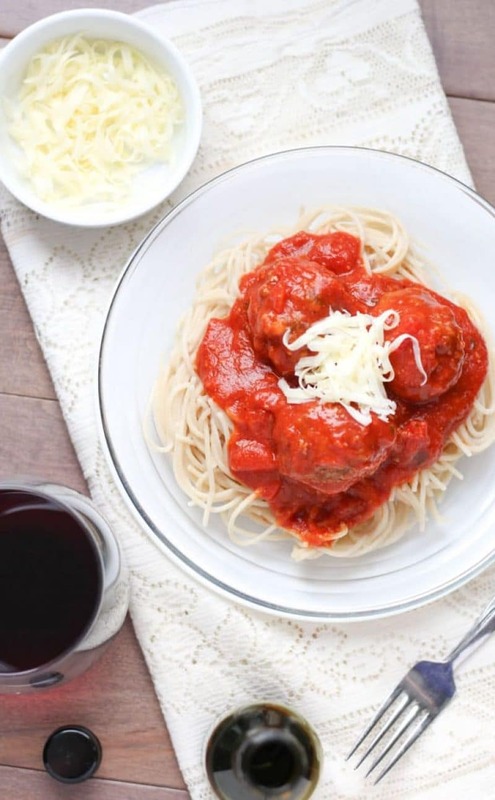 Mix all ingredients together in a medium sized mixing bowl. Form cookie balls with hands about 1 inch each and place on parchment prepared cookie sheet. Flatten each cookie ball with hands to about 2 inches diameter and 1/4 inch thick. 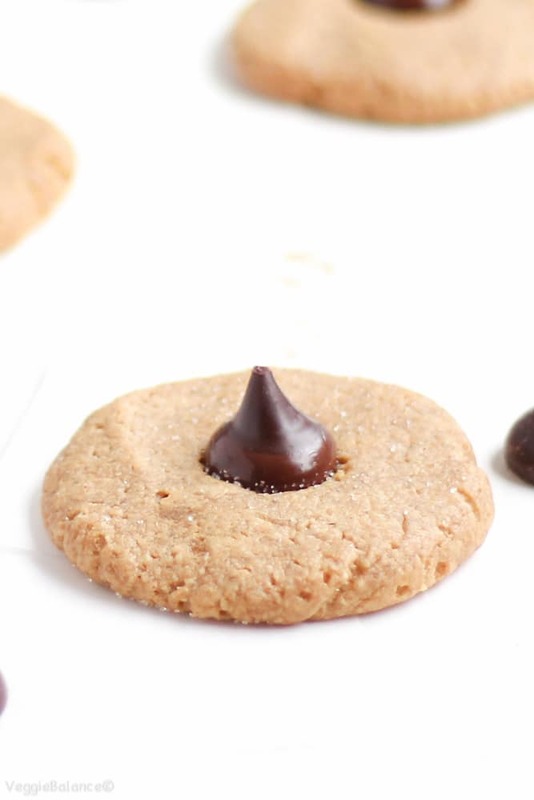 Immediately press in one Hershey kiss in the center of each cookie. Let cookies fully cool on cookie sheet before removing. 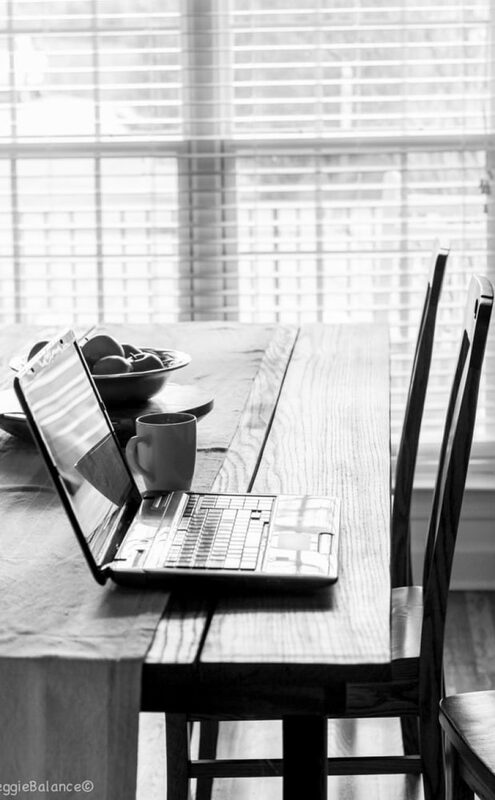 Full-Time Blogging – Is this real life? 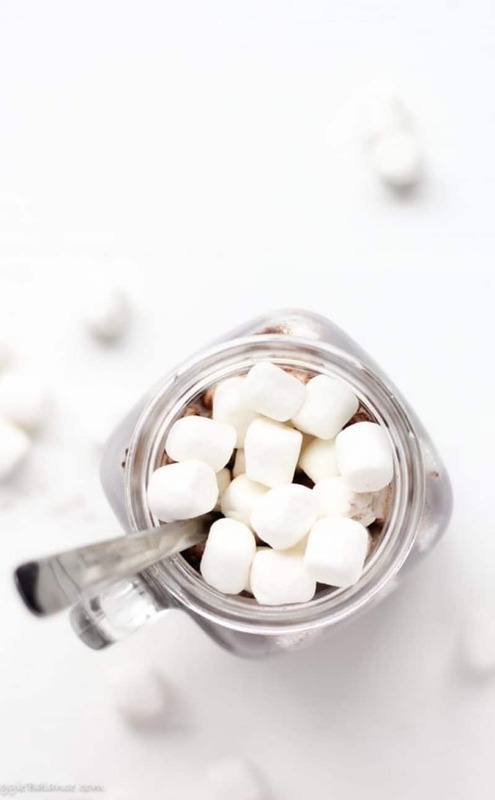 Yummmyyyyyy!! These cookies are the best! 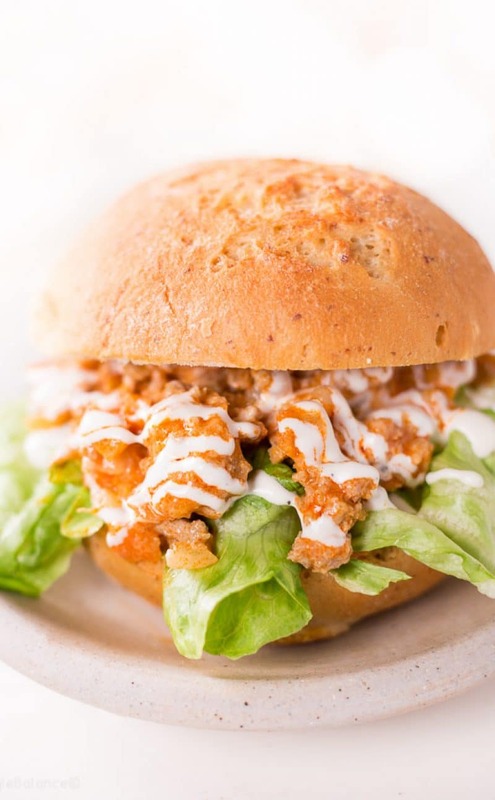 🙂 Would coconut flour work as a sub for the almond? So, you won’t be able to do a 1:1 ratio of coconut flour vs almond flour. 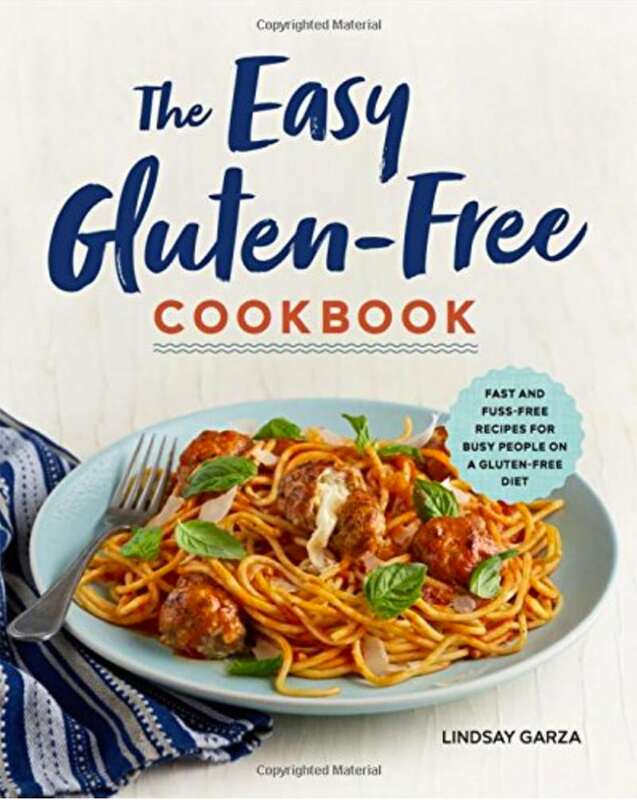 Having a coconut allergy I unfortunately don’t work with coconut flour – BUT from what I understand about it is SUPER DUPER absorbent even more than almond flour. So this is what I would try if I had to make it with it, perhaps someone else that normally works with coconut flour can confirm. I’d keep the 1/3 cup coconut flour and add an additional 2-3 egg whites to help with the super duper absorbent flour. Thats my thinking and my guesstimating. Hope this helps and gets you in the right direction! Holy crow, these were good! I used an equal amount of peanut flour to replace the almond flour. I made half of them as blossoms, and I used the other half as thumbprint cookies. I smooshed the back of a melon baller into them and filled it with jam for a PBJ cookie. Me and my kids loved them! Oh my wordddddddd this sounds amazing for a PBJ cookie. I’ve always had them on my list to make thumbprint cookies but just never have gotten around to it! Made these today. Added the whole egg, and 2 tblsp sugar. They were just right! Delicious! Thanks.